Directed by Georges Franju in 1959/60. A brilliant scientist, Professor Genessier (played by Pierre Brasseur), is guilt-stricken after having disfigured his daughter’s face in a car accident. He has almost perfected the technique of grafting skin tissue and intends to use this science to rebuild his daughter’s damaged face. However, he needs a supply of donors to experiment on. His devoted secretary, Louise (played by the gorgeous Alida Valli), lures beautiful young women to his house. There, in a secret laboratory, Genessier attempts to remove their faces... Muhahahaha! This is probably the one French film that is guaranteed to give you nightmares, Yeux sans visage (Eyes Without A Face) is a magnificent blend of horror and romantic poetry which is also an exploration of the morality of scientific endeavour. It spawned a host of similar films involving crazed surgeons indulging in bodily mutilation, but it remains, to this day, one of the best films of its genre. Even by today’s standards, the horror element of Les Yeux sans visage is pretty shocking. Rather than just titillating his audience with fleeting shots of his characters’ sinister acts, Franju actually forces them to watch, in gory detail, the removal of a complete face from a living human being. Brandishing his surgical instruments with clinical detachment, Pierre Brasseur coldly cuts away as if he is slicing the top of a blancmange. When the film was first shown at the Edinburgh film festival, it is reported that some members of the audience fainted! Of course, horror of this kind is really only effective it is used in context, not just put there (as in too many modern films) to shock. The graphic horror in this film works so well because it is set in a very chilling, deeply disturbing story, populated by some grisly yet fascinating characters. Pierre Brasseur is no two-dimensional mad scientist. His character has a perfectly legitimate and credible reason for the unspeakable crimes he is committing - he is devoted to his daughter and will risk anything to bring her back to the land of the living. His assistant, Louise, deliciously and stunningly played by Alida Valli, is equally misguided, casually cruising the streets of Paris in her adorable Citroën 2CV for suitable victims. Ironically, the one person who can see the wrong in all this is the daughter in question, Christine (Edith Scob), who would rather die that go on living in this nightmare world of having to wear a mask and subjecting herself to her father’s futile experiments. Best of all, the creepiness of these three principal characters is actually eclipsed by the creepiness of the house they live in. Not since Cocteau’s La belle et la bête has the set had such a strong presence in a film. The scene where Christine wanders nervously through the darkened house and ultimately discovers her father’s laboratory is enough to send shivers running up any spine. Maurice Jarre’s sinister music - particularly the jangly waltz theme where Louise is prowling for victims - adds an almost sensuous mood of suppressed terror to the already macabre atmosphere of the film. Where the film does particularly well is in drawing attention to the moral issue of medical research. Can the cruelty that a scientist inflicts on animals and - ultimately - his fellow human beings ever be justified? In this film, we understand why Genessier is prepared to mutilate others to help his daughter and, to some extent, we even start to sympathise with his motives. But the horror of what we see reminds us of the grim reality - progress in science is often there to benefit a privileged minority, and all too frequently it is achieved only through the exploitation of others. Les Yeux sans visage is far from being a cheap thriller. It is a profoundly disturbing study into the morality of human activity, and possibly into the morality of love itself. The sight of the sweet masked daughter playing with the dogs will evoke many - dare I say beautifully depressing - emotions. It's all quite Twilight Zone and wonderful. 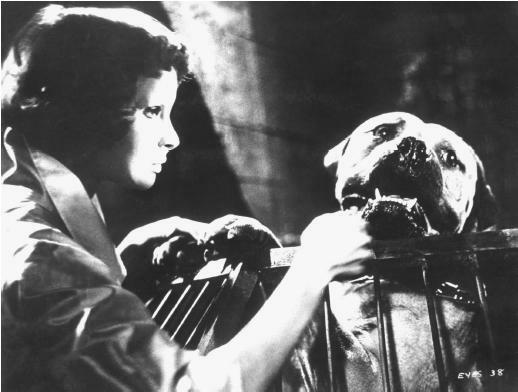 Not to mention, big, sweet, mean-looking dogs and Alida Valli is like honey to my eyes. Oh, and a young Givenchy created the gowns that Christiane wears throughout the movie.